Your one-stop electronic prototype source for printed circuit boards. We have the largest selection of SMT to DIP adapters, SMT to SIP adapters, and breadboards, world-wide. We keep everything in stock, and ship the same day when the order is placed by 3pm. Our company has been built on providing excellent service to students, hobbyists, technicians, technologists, engineers, consultants, and laboratories. 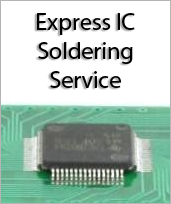 We carry a massive inventory of very cost effective solutions for SMT adapting, and circuit prototyping.